This page features a cool selection of assorted New Years clipart designs. To print these designs, simply right click on any image and save it to your picture file for future use. New Years Eve, celebrated every year on December 31st, is a major social holiday in the United States and throughout the world. In the western world, New Year's Eve is celebrated with parties, noise makers, fireworks displays, and alcohol-fueled social gatherings spanning far past the midnight hour. America's three biggest New Years Eve celebrations are held annually in Las Vegas, New York City, and Disney World in Orlando. New York City has long been famous for hosting a ball dropping ceremony in Times Square. A colorful, illuminated glass ball measuring six feet across begins a slow descent at 11:59 pm. It touches down at exactly midnight. This is usually followed by an off key, out-of-sync rendition of Auld Lang Syne, sung by many thousand wasted party goers who can't remember the lyrics. Auld Lang Syne is a song that was composed by Robert Burns in the 18th Century. The term means "old long ago" or "the good old days." The tradition of a ball drop to signal the passage of time began at England's Royal Observatory at Greenwich in 1833. The Catholic Church denounced any New Year's celebrations as paganism. People of some cultures eat ring-shaped food (such as doughnuts and bagels) to bring good luck on New Years Eve. 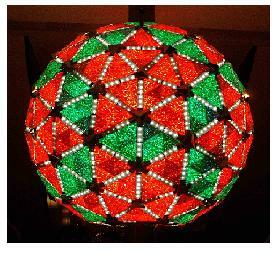 New York City's first New Year's Eve ball was five feet in diameter and weighed 700 pounds. 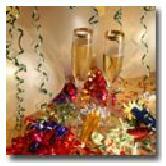 The most popular American New Years Eve traditions are making resolutions and kissing a loved one at midnight. For more holiday designs and many other free printable items, visit any of the links shown on this page. See this link for more info about United States Holidays.